PIGEON FORGE, Tenn. (CNS) — St. Mary’s Catholic Church was at ground zero in the wildfires that devastated parts of Gatlinburg and Pigeon Forge Nov. 28, and while flames reached to within yards of the tourist city church, it appears to have been spared. Some parishioners weren’t as fortunate. Its pastor, Carmelite Father Antony Punnackal, was forced to evacuate St. Mary’s as intense fires came within 300 yards of the church that sits in the heart of Gatlinburg. The church and rectory have been closed since then, but the priest has received reports that the buildings were spared from the blaze but sustained smoke damage and possible damage from high winds that fueled the flames. The wildfires left a swath of destruction in and around the city of Gatlinburg, causing at least 13 deaths, more than 50 injuries, and tens of millions of dollars in property damage. Dozens of residents and visitors to the tourist destination still are missing. Three people who suffered serious burns were transported to Vanderbilt University Medical Center in Nashville. As of midday Dec. 2, the city of 5,000 residents still was closed down, with only emergency personnel allowed to enter as well as residents and property owners on a limited basis. Many evacuees reported fleeing through horrific infernos, with intense flames licking at their vehicles as they fled down narrow mountain roads to safety. But a number of residents and tourists perished in the flames, and rescue workers still were trying to account for everyone. Some members of Holy Cross Parish in Pigeon Forge also lost their homes, belongings and businesses. The fires burned nearly 16,000 acres in the Great Smoky Mountains National Park. Father Punnackal was told he could re-enter Gatlinburg Dec. 2 to assess the church and rectory. But he could only stay for a few hours. He said that as he monitored the spreading fires Nov. 28, smoke was entering the church and rectory to the point it became unsafe to breathe. Shortly thereafter, he was forced to evacuate with just an overnight bag as fire threatened the property. Father Punnackal has been staying at Good Shepherd Catholic Church in Newport while his parishioners were spread out in shelters and hotels, or with family or friends. 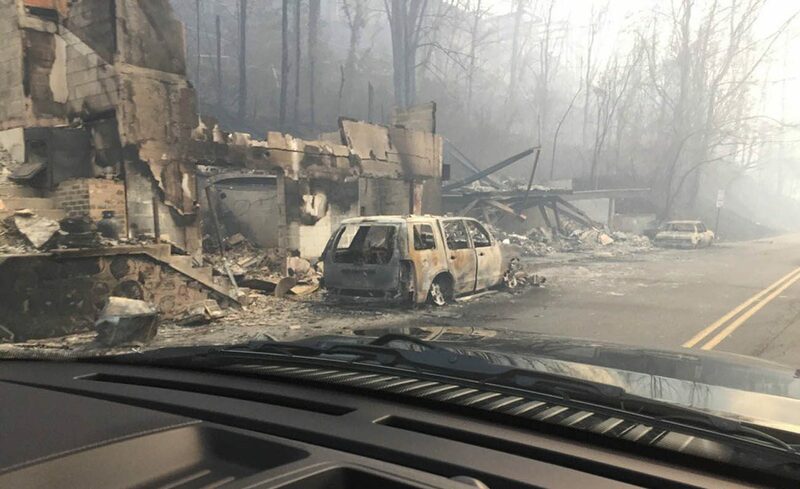 While a severe drought over several months prompted many of the recent eastern Tennessee woodland blazes, officials are investigating whether some of the wind-whipped fires above Gatlinburg were caused by individuals, either accidentally or intentionally. As a stream of vehicles exited Gatlinburg and surrounding areas, shelters were set up to accommodate those displaced, which numbered as many as 2,000 at one point. Evacuees were receiving food, clothing and other help in shelters set up by the American Red Cross, said Father Andres Cano, pastor of Holy Cross. Father Cano was assessing the impact of the wildfires on his parish. As of Dec. 1, the parish knew of one family that lost their home to fire, but more could be affected. He also said parishioners’ employers in and around Gatlinburg were affected, and those parishioners are now out of work. Knoxville Bishop Richard F. Stika has been working with volunteers from around the diocese to get assistance to the Gatlinburg and Pigeon Forge communities. On Dec. 1, the bishop announced a $25,000 grant for fire victims through the Diocese of Knoxville’s St. Mary’s Legacy Foundation. The $25,000 grant is in addition to $735,000 that the St. Mary’s Legacy Foundation will be distributing to charities and nonprofit groups throughout eastern Tennessee in 2017. “What happened in the Gatlinburg area was unexpected, and each day we’re hearing about more lives lost, more property destroyed, and more heartache for many, many people. The St. Mary’s Legacy Foundation has a very precise way of evaluating grant distributions before they’re announced. In this case, the foundation felt it was best to react to this tragedy immediately,” Bishop Stika said. “The St. Mary’s Legacy Foundation also recognizes that many communities across our entire diocese have been affected by wildfires, and more recently, tornadoes. For this reason, the $25,000 grant will be channeled into our diocesan Fund for Wildfire Victims. We want to make sure we can help everyone who needs assistance,” he added. East Tennesseans began donating needed items to the Sevier County relief effort early Nov. 29, and those donations continue. Sacred Heart Cathedral in Knoxville began a drive to collect bottled water, food, and clothing that has turned into a multiday effort. Those donated goods were delivered to the National Guard armory in Sevier County, just outside of Pigeon Forge, where Guard troops are assisting in the relief effort. Diocese of Knoxville schools also took part in collecting donations. Bishop Stika said offers for assistance were coming in from around the country, including from Archbishop Paul D. Etienne of Anchorage, Alaska, who chairman of the U.S. Conference of Catholic Bishops’ Subcommittee on the Catholic Home Missions, and the Archdiocese of New Orleans. He said Archbishop Joseph E. Kurtz of Louisville, Kentucky, has helped in getting information out about the relief effort. “It just shows that the Catholic Church is the face and hands of Jesus, and that we do together what we can’t do by ourselves. Together, with the Holy Spirit, we can overcome anything,” Bishop Stika said. The diocese is accepting donations online for its assistance fund at http://tinyurl.com/j6gf2wd. All parishes and mission churches in the diocese were asked to hold a special collection at Masses the weekend of Dec. 3-4 for relief efforts. The wildfires damaged or destroyed more than 700 homes and businesses, including about 300 buildings Gatlinburg and about another 400 in Pigeon Forge. Sevier County native Dolly Parton announced her My People Foundation will give $1,000 a month in assistance to people affected by the wildfires that also destroyed a number of cabins near the Dollywood theme park. The theme park itself was not damaged in the fires, according to Dollywood officials. Father David Boettner, rector of Knoxville’s Sacred Heart Cathedral, also was working to get assistance to St. Mary’s and Holy Cross parishioners. He is confident the popular tourist destination will rebound. Brewer is editor of The East Tennessee Catholic, magazine of the Diocese of Knoxville.